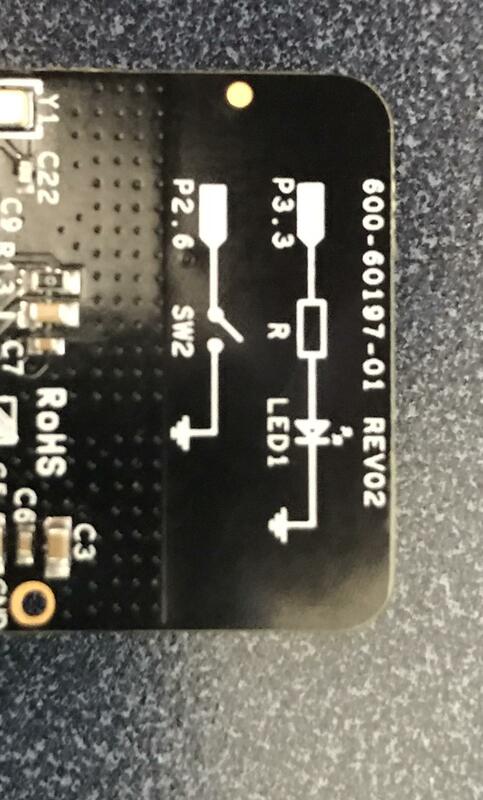 In the previous article I showed you how to build PSoC4 BLE Central firmware to talk to a BLE Peripheral. When I did that firmware I built it to program into a CY8CKIT-042-BLE kit. 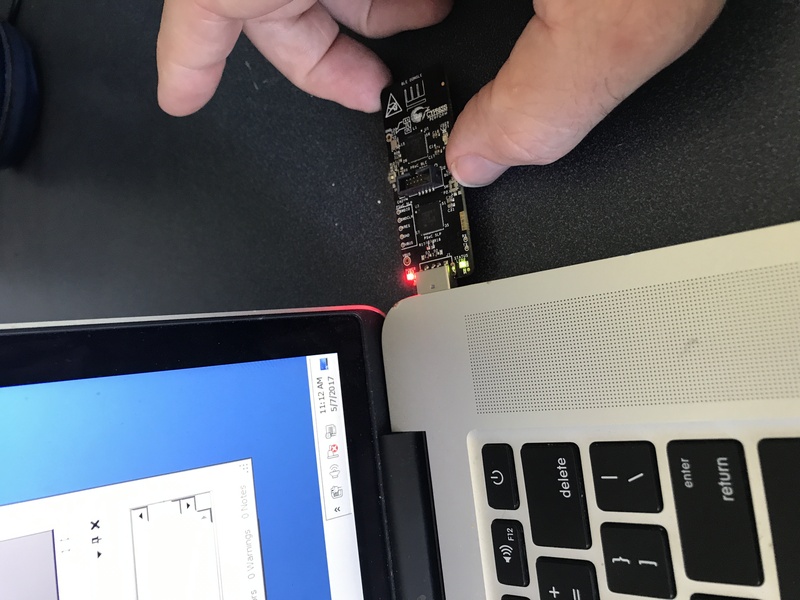 What I should have done was made the firmware work with the CySmart Dongle. An error that I will fix in this article. As you can see in the picture above, the CySmart dongle is a USB dongle with a PRoC BLE Radio on it. 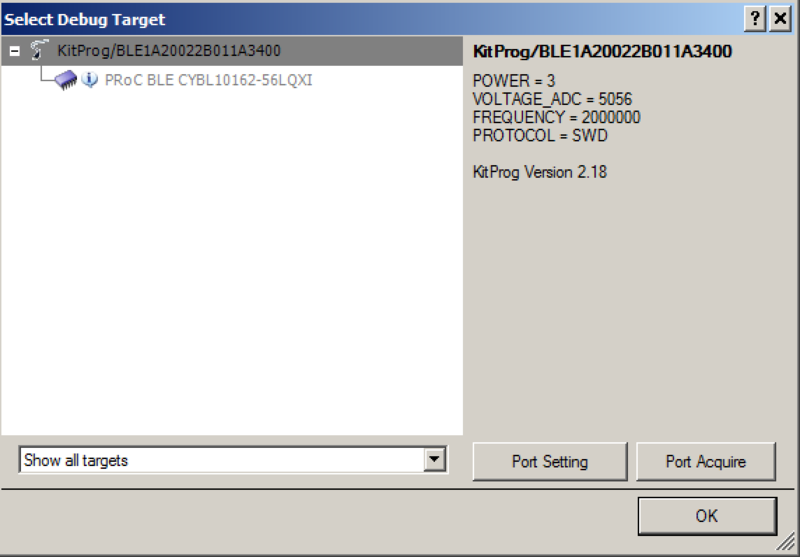 It uses a PSoC5 programmed with the KitProg firmware to bridge from the PRoC to the PC. 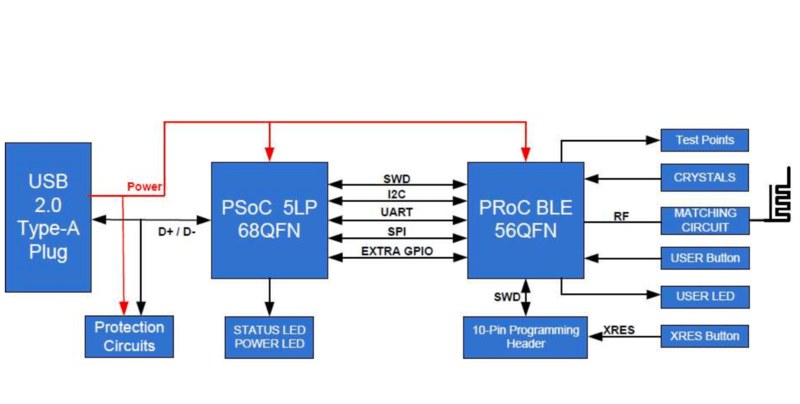 In the diagram below you can see that it can bridge SWD, I2C, UART and SPI. In addition the dongle has 1 user button and 1 user LED. 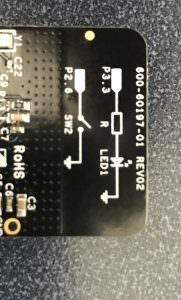 This is perfect for the PSoC4 BLE CapSense LED GAP Central Project that I built in the previous article. 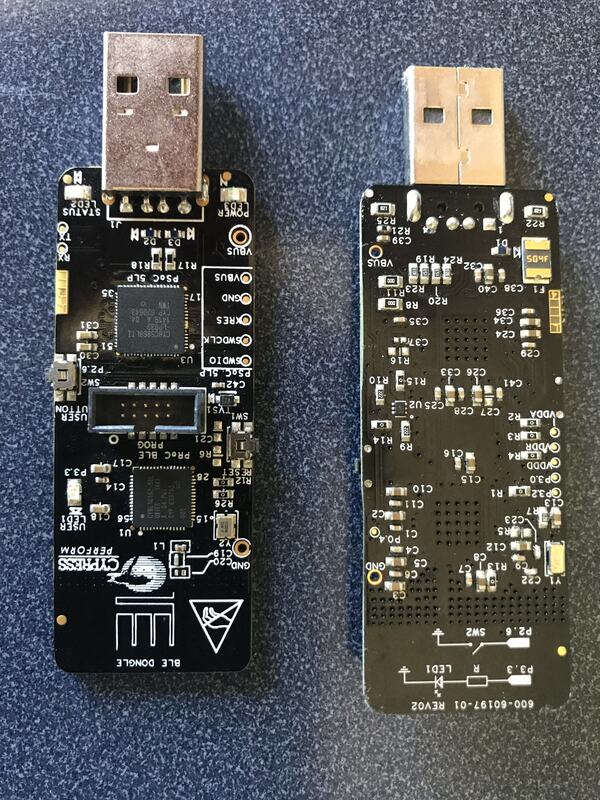 You get the CySmart dongle as part of the CY8CKIT-042-BLE Kit. 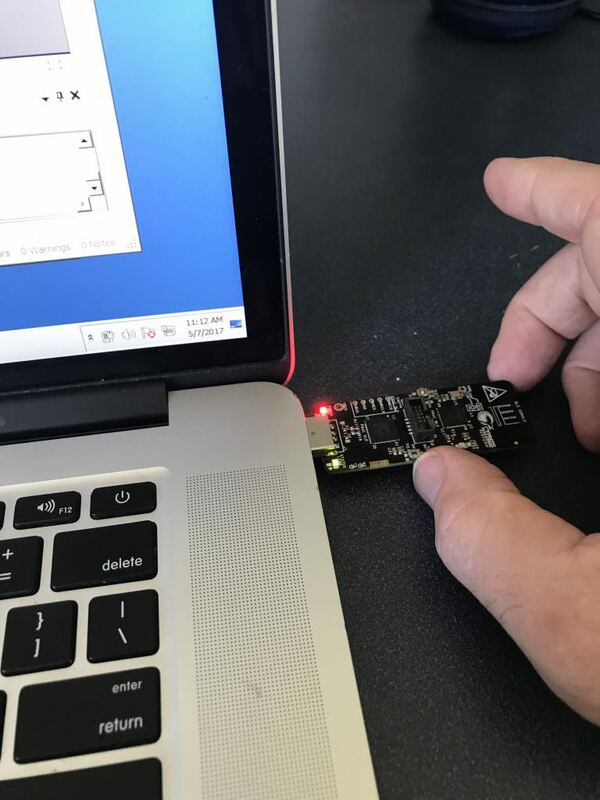 The dongle comes programmed with the CySmart Firmware which enables you to connect to the CySmart PC Program (more later in this article). 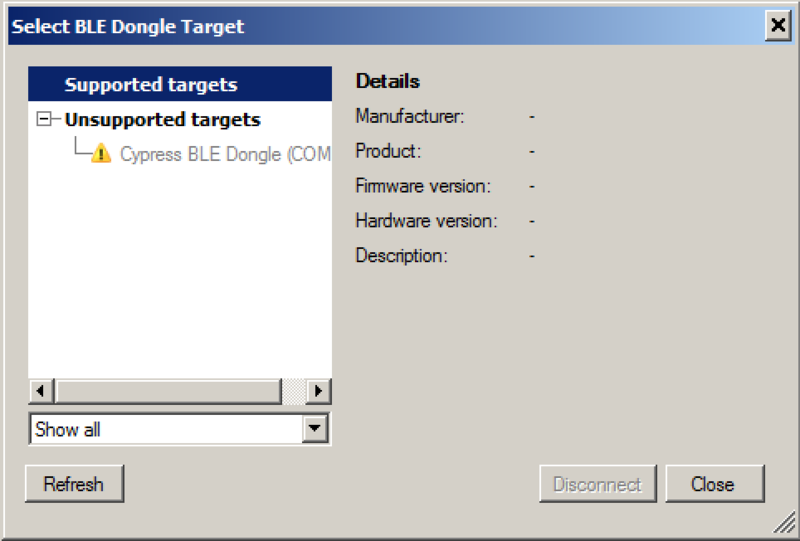 Literally (well almost) every time I plug in a CySmart dongle, I get this message telling me that it is an “Unsupported Target”. 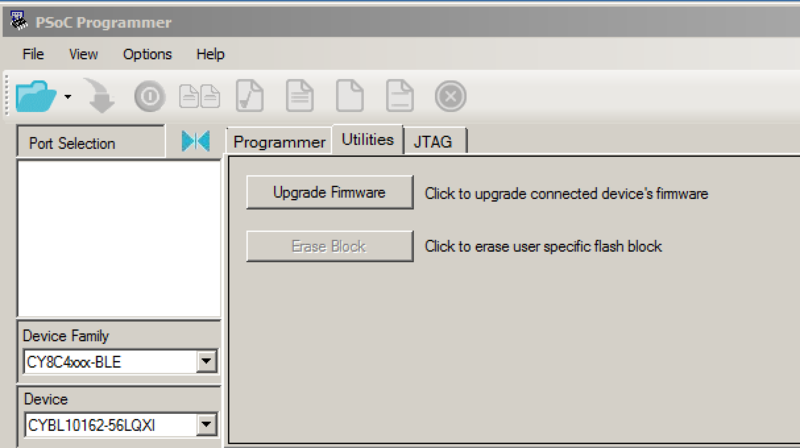 This means that the firmware is out of date and needs to be updated. 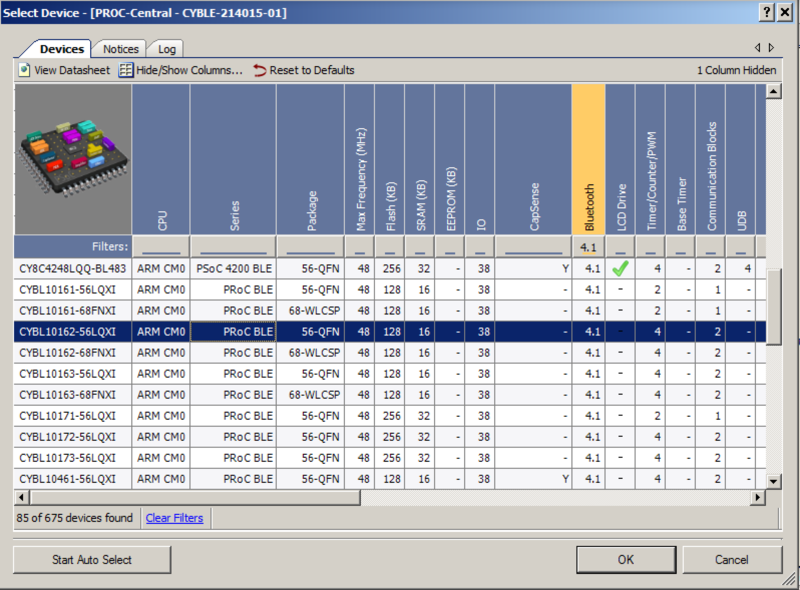 In order to fix the firmware, you need to quit the CySmart program, then start the PSoC Programmer software. 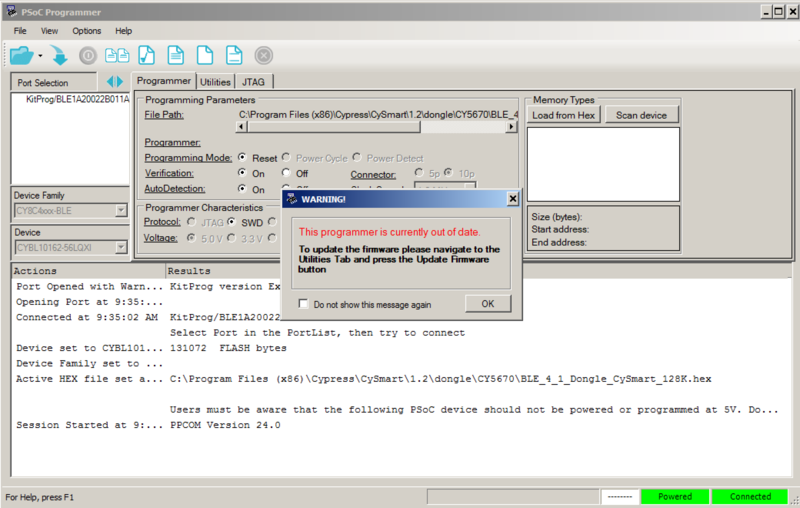 And, I also find that every time I start PSoC Programmer that the KitProg firmware is out of date. To fix this press OK.
Once the KitProg firmware is up to date, you can then program the CySmart firmware. 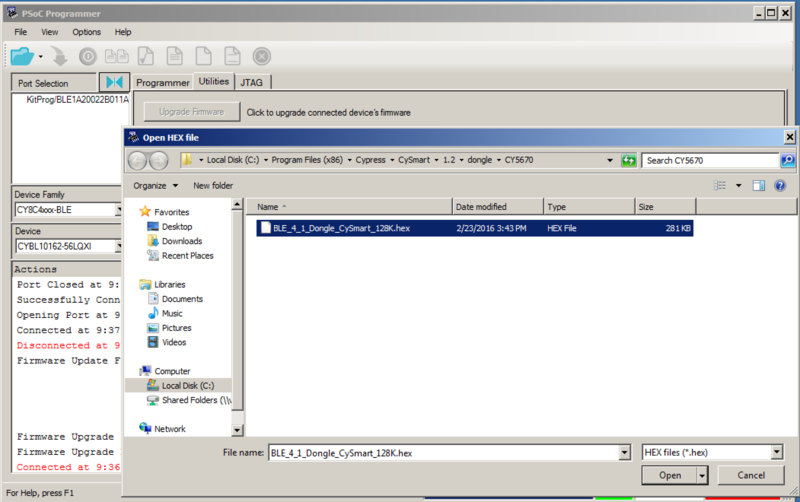 Press the “folder” button, then navigate to the firmware which lives in Program Files(x86) –> CySmart –> 1.2 –> dongle –> CY5670. Then press the “down arrow” which means “download the firmware”. 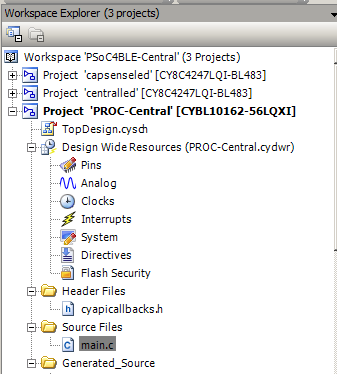 Once that is done, you are good to go with running CySmart (quit PSoC programmer so that it can talk to the dongle). Now that I have a functional CySmart dongle, I can run CySmart. This is a Windows PC Version of a GATT browser (like the CySmart iOS/Android App or the LightBlue app that I used in the previous article). In CySmart press “Start Scan”. 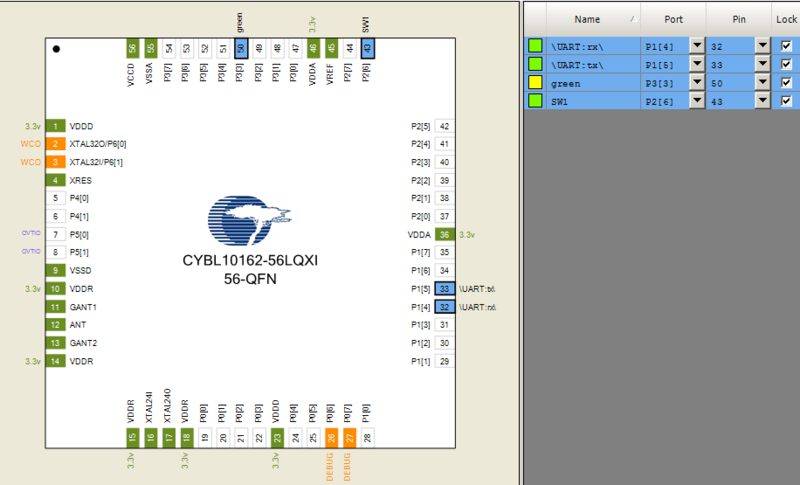 In the picture below you can see all of the BLE peripherals that CySmart can see, including the “capled” project. Once I click on “capled” and then “connect” and finally “discover all attributes” I will get a window that looks like this. 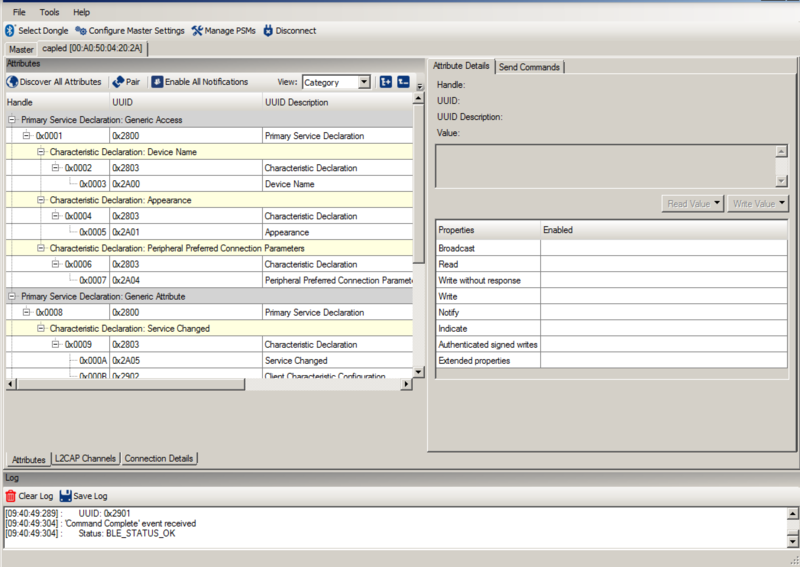 You can see all of the GATT Database. After that I can Read and Write attributes (like the LED Attribute) by typing the value I want to write into the box on the upper right, and pressing “Write Value”. For example you can turn on the LED by writing a “1” into the LED characteristic. The pin assignments are a little bit different. On the back of the board you can see that we put a handy-dandy picture showing the arrangement for the LED and the button. 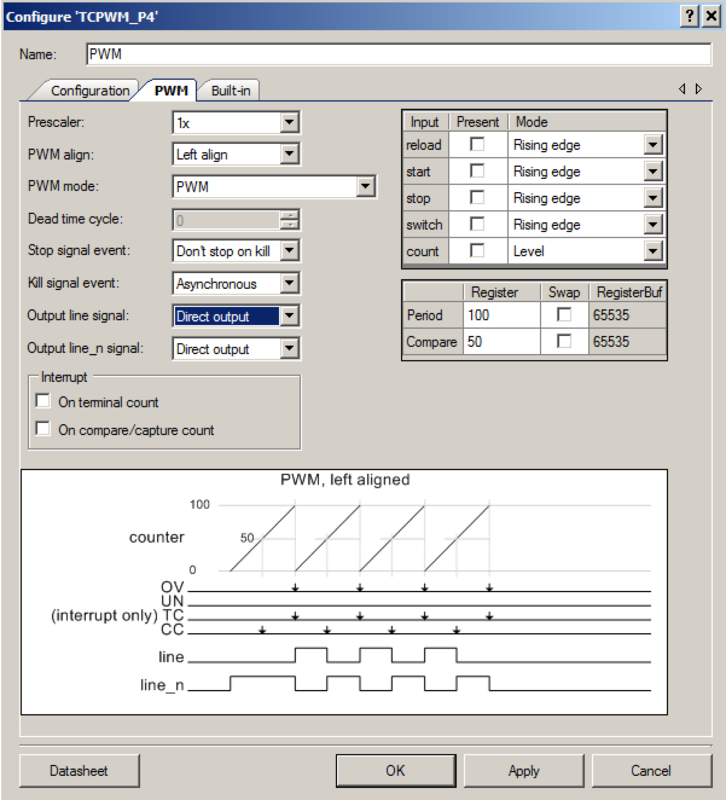 Finally you need to change the PWM to be active high instead of active low. Now program and test it. The user switch is the tiny little button under my thumb. 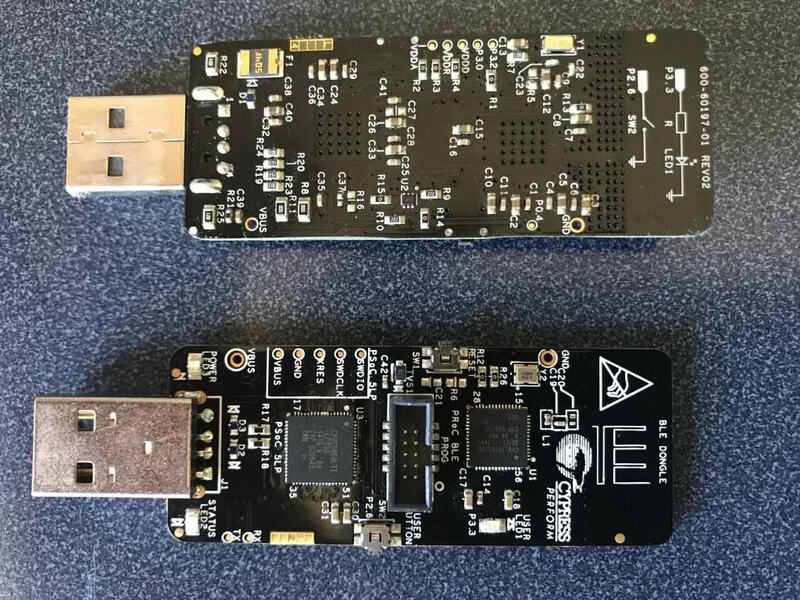 As with the previous article you can find all of this source code on the IoT Expert Github site or git@github.com:iotexpert/PSoC4BLE-Central.git. 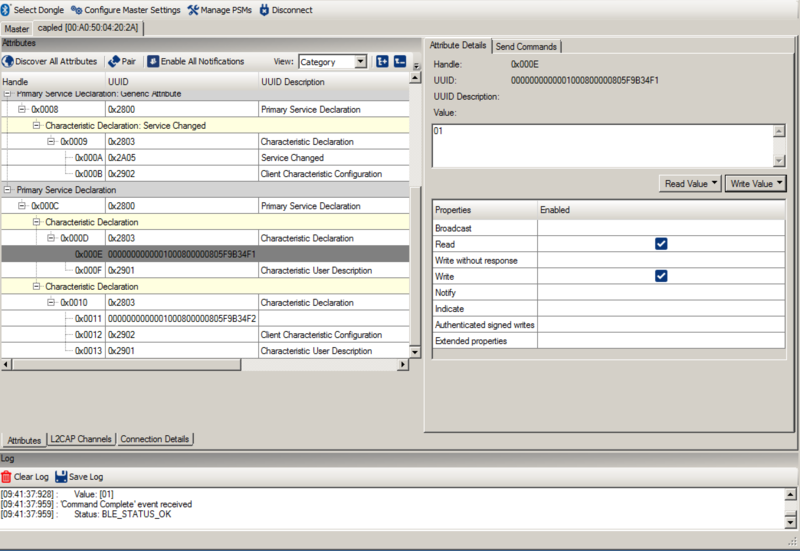 In the next article I will start the process of building a GATT Browser inside of a PSoC4 BLE.